When investing in something large or costly you want to know that it will last. Every brand and business will always guarantee a quality product, but we often discover that this is not actually the case. So as a consumer, it is always reassuring to have a warranty that can be claimed upon just in case. 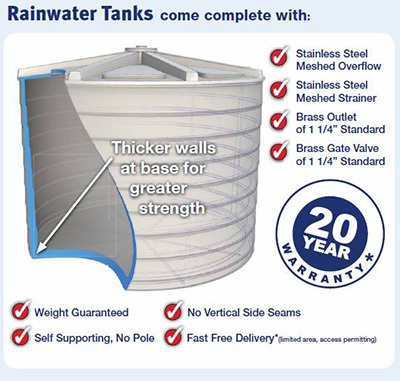 There are many rainwater tank suppliers offering extensive water tank warranties. Some may not even be the manufacturer of the tank, so it’s rather unclear how such assurances can be legitimately provided. There have been many cowboy rainwater tank suppliers in the past who came and went leaving Australian customers high and dry. The water tank industry boomed during Australia’s Millennium drought. Once the industry began to slow down, many water tank suppliers exited along with their warranties. Furthermore, many popular Australian water tank brands have in fact been bought out. This change in ownership normally voids any previous warranty provided on your rainwater tank. So if you purchased a tank a week ago, and the manufacturer gets bought out, then they no longer need to honour your warranty! Not only can you rely on National Poly Industries to supply a quality made tank, but you take be reassured of the fact that when we say “20 year warranty” that this is a genuine warranty evidenced by our longevity. At National Poly Industries we would prefer customers to not be hassled by having to claim on their warranty. This is why we went to great lengths to become an ISO 9001 accredited company. This assures you, and us, that we have the highest quality and safest manufacturing processes from start to finish. Ultrasonic thickness testing – guarantees all our poly tanks exceed 4.5mm thickness all over as required by AS 4766. Impact testing – ensures the strength of plastic, cut out from the inlet strainer, is not brittle and has correctly formed. Visual inspection – the interior and exterior of all tanks are visually inspected by experienced staff to ensure there are no defects. Great lengths are taken to not just build a poly tank, but to test each tank before it leaves the floor that it is indeed built very strong and to an extremely high quality. For consumer reassurance, to cover the “just in case” scenario, National Poly Industries back this with a 20 Year Warranty that you can trust!